Me and Ro is a designer and retailer of fashion jewelry in New York. The Me and Ro Company was founded in the year 1991 and has its shop in New York and also sells its products online. 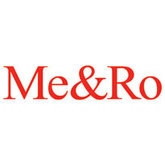 The products of the Me and Ro Company is also available in many specialty stores in USA and worldwide. The Me and Ro jewelry can be seen in many magazines such as In Style, Marie Claire, Elle, Glamour, Town and Country, and Vogue. The Company also has celebrity following such as Charlize Theron, Kate Moss, Gwyneth Paltrow, Julia Roberts, and so on. There are currently 0 consumer reviews about ME & Ro available. Share your review. Please take a note that you are about to post a public review about ME & Ro corporate office on CorporateOffice.com. This review will be public, so please do not post any of your personal information on this website. If you would like to contact the corporate offices of ME & Ro, please use their contact information such as their phone number, website, and address listed above to contact them. However, sometimes staff from ME & Ro headquarters do read the reviews on this website.